The last weekend was the last, and therefore the final Driftchallenge Gymkhana Transport Project in Olomouc. But he did not come to any of the popular and well-known circuits, but in the parking lot provided by the Olympia Shopping Center in Olomouc. Thanks to its size, we could make the final as a dual race, making classical races more attractive for both riders and especially for those who have come a lot more seriously and who have created an unforgettable atmosphere despite the autumn cold weather. The organizer set up a demanding, interesting and long track, which caused some minor difficulties in the beginning, but with the help of the printed maps of the track, distributed during the registration and mostly glued next to the wheelchairs of the racing cars, did not take long and all literally passed the bends more or less blindly. The whole Saturday was devoted to training and drifting, when any of the spectators could be riding and could experience the feeling of riding in controlled skidding. The organizer also met riders who attended other events and qualifiers on Saturday, and the battle was scheduled for Sunday. It paid off and the startup was acquired and the whole day was what to look for. and Václav Hejda in the PRO and SEMI PRO group. After the spider was assembled, the riders stood up in the battle and rode away. Some duels were so balanced that they only decided to penalize for concealed and shifted cones or poor parking. In the end, however, both qualifying champions confirmed their equestrian superiority, and Jan Linhart from Street won second place behind Tomáš Tuháček, who secured his position and became the Czech Champion. The third place was scored by Lukáš Herbe, who defeated Luciana Wang for 8 seconds. In the PRO and SEMI PRO category, the winner of the qualification, Vaclav Hejda finished third in position behind Jan Konečný, who was literally arguing for the feast with Dominik Kouba, who also secured the position of the master. In the field of play we could see new riding names that we will definitely see in the next season and also Olga Lounová with its black-and-white Nissan, who was willing to bring the audience and the guests of the event. The new feature of this final was that everything was broadcast via livestream on the youtube channel drifting.cz, so viewers who could not arrive, did not miss anything. The special prize for the victory of the "sympathetic drifter" was announced, thanks to the audience's response to the popular Dominik Kouba, who also received a voucher for fuel from our partner Shell. Another Driftchallenge category is behind us and we can fully concentrate on the last two drifting events in the Nürburgring in the second half of October and the Grand Final will be held in Brno on the Autodrome in the end of the year. So we have something to look forward to, and we are still waiting for a lot of interesting events, as well as the big ceremony of the season in the Misch Masch club where we give all champions their championship cups and winnings. 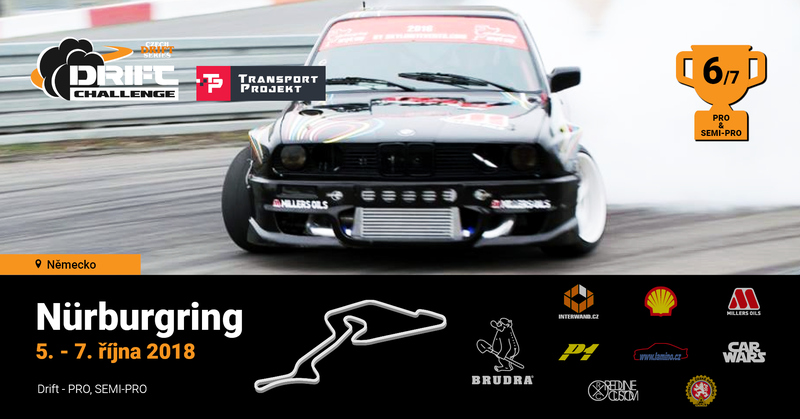 For further information do not hesitate to follow our web site www.drifting.cz and our instagram @driftingcz. We look forward to seeing you in Germany and then on the Masaryk Circuit in Brno.